Our training is designed to arm you with the tools necessary to provide physical, emotional and informational support to birthing families; whether they are birthing in a hospital, birth center or home. We will co-create a space to explore ways to reclaim and preserve traditional birthing practices within this modern birth culture. 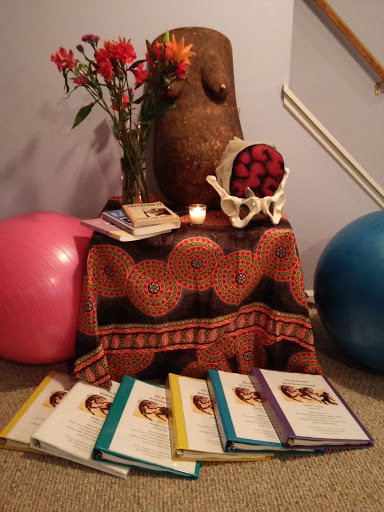 Honoring the legacy of Grand midwives, Creating a sacred birthing space , Comfort measures from around the world including aromatherapy, acupressure, rebozo, herbology, homeopathy and more. The business side of being a doula, visualizations and meditations for sacred birthing, How to facilitate a Birth Blessingway, Whole body health during pregnancy, Normal Physiological Labor, Common medical interventions and how to help when they are needed, Positive and Effective communication, Birth plan preparation, Linkage to community resources, Facilitate communication between mother and partner/family and medical personnel, Infant care education and support, motivating and supporting women in breastfeeding, Perinatal Mood Disorder screening and so much more! The other steps include taking a childbirth class, breastfeeding, book reviews and attending 3 births as a doula in training. 9:00 am Leave to go to Puerto Viejo Farmers Market - Meet Local Farmers, See Local Tropical Produce! Free Day to Relax and Have Fun, explore Puerto Viejo! Nilajah Brown has had the honor of serving pregnant families for over 20 years. She brings a wealth of traditional birthing wisdom from African, Caribbean and Native American cultures. She is a professionally trained and certified mother, pregnancy yoga teacher, childbirth educator, midwife assistant, doula, doula trainer, reiki practitioner, and breastfeeding counselor. Reclaiming pregnancy/childbirth as a sacred rite of passage is her life's work and passion. “It is my belief that all women instinctively know how to birth their baby. When women trust their own powerful knowing on the inside, and not the well intended advice from the outside, they will birth as nature intended them to. For a woman to open up and birth naturally, she must feel safe, in her surroundings, whether that is in a big hospital, small birthing unit or at home. Only a mother knows with whom and where she feels safe. I believe that every birth a woman has is perfect for her and her partner’s evolution. The growth that comes from challenging births is equal to the joy that manifests through these changes." *Buddy Discount - register with another friend and receive $100 off registration! Place deposit of $100 to hold your spot via the course website, a second payment of $1150 by via the course website, and final payment of $300 cash due upon arrival . ​There are limited spots for this course and they are filled on a first come first serve basis. All payments are final, non-refundable and non-transferable. Though our trips tend to fill several months before that time. Once payments are made in full Wild Ginger is unable to issue refunds of any kind because we prepay for the activities/accomadations you receive on the trip and do not receive refunds for said payments. All payments are final, non transferable and non refundable. We are truly appreciative of those who are able to bring with them donations of HERBAL BOOKS, plant clippers, garden gloves, Dr. Bronners, tea tree essential oil, beeswax, lavender essential oil, activated charcoal tablets, wide mouth quart size mason jars with lids (plastic lids are best so they don't rust in the tropics), bandaids of all sizes, gauze, ace bandages, gauze, brown tincture bottles 1/2 oz, 1oz, 2oz, and 4oz, yoga mats, towels, books, sketchbooks, art supplies, sheets (single or double), tapestries, massage table, good cookware (hard to get around here!) Bulk organic teas by the pound are super appreciated especially red raspberry leaf, oatstraw, and nettles. What's included In Your Trip! The price includes your stay at Centro Ashé in Manzanillo and our beachfront cabinas in Punta Uva. Accomodations are rustic, simple, basic, have wifi, hot water for showers, and are shared. Costa Rica, each of the classes and tours (and transportation to and from said tours) outlined on the itinerary as well as breakfast each morning. We will include certain lunch and dinners in the trip, please read the itinerary carefully so you know which meals you are responsible for. PRICE DOES NOT include flight to and from Costa Rica. We accept credit card via Paypal, check or money orders, please contact info@centroashe.org in order to make a payment. You will receive a receipt upon payment. **All participants must be 18 years of age or older unless with a legal guardian. ** Please note, by registering for this tour you acknowledge Wild Ginger Herbal Center acts only as agents for the various independent suppliers that provide hotel accommodations, transportation, sightseeing, activities, or other services connected with this tour. Such services are subject to the terms and conditions of those suppliers. Wild Ginger Herbal Center and their respective employees, agents, representatives, and assigns accept no liability whatsoever for any injury, damage, loss, accident, delay, or any other incident which may be caused by the negligence, defect, default of any company or person in performing these services. Responsibility is not accepted for losses, injury, damages or expenses of any kind due to sickness, weather, strikes, hostilities, wars, terrorist acts, acts of nature, local laws or other such causes. All services and accommodations are subject to the laws and regulations of the country in which they are provided. Wild Ginger Herbal Center is not responsible for any baggage or personal effects of any individual participating in the tours / trips arranged by Wild Ginger Herbal Center. Individual travelers are responsible for purchasing a travel insurance policy, if desired, that will cover some of the expenses associated with the loss of luggage or personal effects as well as their personal health insurance policy. Wild Ginger Herbal Center is not responsible for providing your health insurance or healthcare while on the trip, are not responsible for any flight cancellations or changes to your personal travel itinerary not provided by the trip. The itinerary and schedule are available on www.centroashe.org and the exact activities may change slightly based on weather while on the trip. Occasionally weather can become an issue and we reserve the right to not participate in a certain activity if it is deemed unsafe due to weather (boat ride etc) but we will replace that activity with another of equal value. Most people when they talk about the rainy season it actually refers to the pacific side, which has a very distinct rainy season, 6 months dry, 6 months wet. We will be on the Caribbean side, and while yes it rains, it is more evenly balanced through out the year. That doesn't mean it won't rain, because it certainly can and possibly will. We'll just have to do our best for the tour and respect nature - we'll need to be flexible. As far as clothes, bring light weight stuff that dries easily, it is HUMID! Bring a good pair of shoes to hike with that you dont mind getting muddy, and flip flops, and whatever else you'd like to have with you. Cotton tshirts and shorts are great, a rain jacket, bathing suit, towel, are all great. Yoga mat if you'd like. Bring natural bug spray if you're into that because you can't get that down there, however natural/organic shampoos/soaps/lotions are available. Bring any regular medications/supplements you use. Bring SUNSCREEN! A hat. Sunglasses. Waterbottle (we will provide potable water as you all shouldn't drink out of the taps there). As far as a laptop - there is internet in town so you're welcome to bring it, just depends how connected you'd like to be! It's another thing to travel with and to be conscious of while you're on buses etc. But it can be convenient, so that is totally your decision. Outlets there are the same as the US, no converter is needed, and you have a few options for making phone calls. You can purchase a cell phone at the airport, not exactly sure how much those cost but I know they are available. The other very simple options is to use the phone cards there, they sell them at most convenient stores ("supers" or "pulperias") and they are in increments of about 2000 or 5000 colones (about $10) . 5000 colones buys you about 18 minutes of talk time to the US, its great to have for quick conversations, and these can be used from any public or private phone in Costa Rica. If you do bring a laptop then you can use that to Skype or GoogleCall to the states as well, MUCH better rates. General Health- Malaria, while common in parts of the tropics, is really not issues in Talamanca. Dengue is a very rare issue, but as it is more prevelent in highly populated areas - and there is no prevention besides mosquito protection. We do ask that you bring a basic first aid kit for yourself, as well any basic immunity support from natural health aids, including vitamin c, iburprofen, tea tree oil, lavender oil, grapefruit seed extract, charcoal tablets, acidophilus or other probiotic supplements, EFA's, and homeopathic remedies for bites, stings, sunburns, and digestive issues. Certain vaccines are required when traveling from certain countries, please check before booking your travel to make sure you are able to comply with all requirements. You can check out http://www.worldnomads.com/ travel insurance for independent and adventurous travellers, available to residents from over 150 countries. You are responsible for purchasing your own airfare as well as your transportation to Manzanillo, Costa Rica. You can check out various travel websites, many times www.kayak.com will have good deals. You will need to fly into San Jose, the capitol of Costa Rica. If you fly in and need to stay the night in San Jose we love Costa Rica Backpackers, or Hotel Aranjuez, as well as Costa Rica Guesthouse. Costa Rica Backpackers is an inexpensive hostel type environment, pretty young crowd. Hotel Aranjuez is gorgeous, in expensive private hotel rooms, amazing buffet breakfast outdoors under a mango tree, but their reservation process can sometimes be tricky, check their website for more details. Costa Rica Guesthouse is directly across the street from Costa Rica Backpackers, it has clean nice private rooms, and reservations online are simple. ** Please note that if you are from the United States upon entering Costa Rica you do not need a special visa if you are coming from the US, however you need proof of exit (a plane ticket, bus ticket etc you have pre purchased and printed) within three months of the date you enter. Do not forget to print your return ticket and keep it with you. You also need a valid US passport. **Please also note that the travel time and bus schedule between San Jose, the capitol where you fly in, and Manzanillo the town where we will meet is about 5 hours. Food - We serve an abundance of beautiful Caribbean and Latin inspired foods during this trip which includes lots of salads, fruits, veggies, some meats, seafoods, beans and rice. Meals tend to be pretty heavy, but in case you need extra snacks there are several small farmers markets in town. Water - We do not recommend drinking local water once you are in Manzanillo, you will need to purchase water at the local shops in town, it is available in several gallon bottles and you can use these to refill your water bottles. We will provide filtered water at your meals. Tap water in San Jose is safe to drink though we do not recommend drinking the water in the Caribbean.